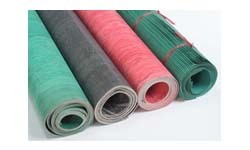 Quick Overview: RGS Oil resisting Asbestos rubber sheets are made from good long asbestos fiber, oil-resistant synthetic rubber, heat resisting material compound heating and compression molding. It used as sealing material in the joint of oil pipeline and sealing gaskets. Oil resisting Mineral Fiber rubber sheets are made from good long Mineral Fiber, oil-resistant synthetic rubber, heat resisting material compound heating and compression molding. It used as sealing material in the joint of oil pipeline and sealing gaskets. B703M1 -- Aviation Oil-resisting and metal strengthening.